Formed over 20 years ago sometime in the 90s, Groupo Mambique is a pioneer of chamber mambo. Featuring two trombones and two master percusionistas, Groupo Mambique brings the Horns and drums from the backline to the frontline with blazing intensity playing clave-related dance rhythms from the Carribean, Lower Antillies, Cental and South America as well as NYC-style Salsa Dura. 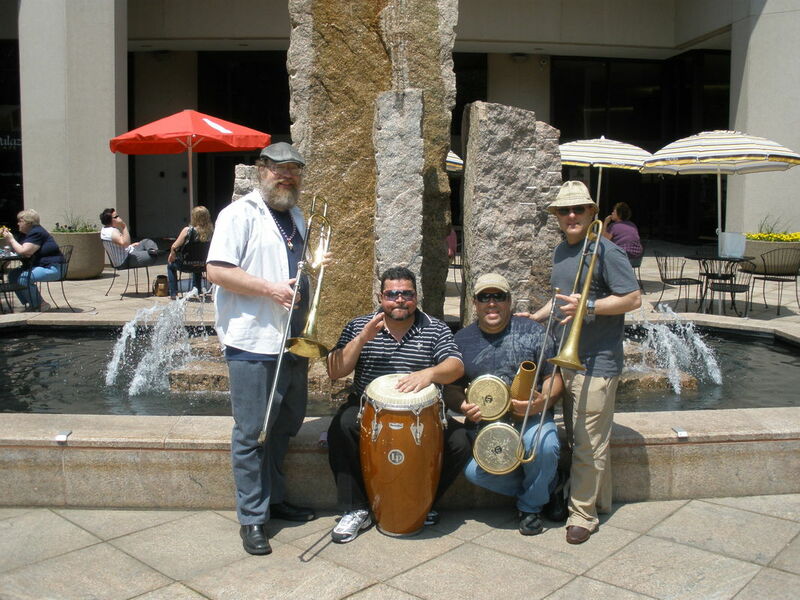 Take an extensive education through the ranks of Julliard and the New England Conservatory, flavor it with Latin rhythms and a lot of soul, and what you get is the legendary "Mondongo," one of the busiest trombonists, and most recognizable faces on the rich New England Latin music scene today. For nearly twenty-five years, well-versed in the various styles of classical, jazz, Latin (salsa, cha-cha-cha, merengue, bomba, plena, among others), Mondongo has been playing, writing for, and directing bands, in most cases as the first to call. He has also performed and recorded with stars such as Tito Puente Jr., Giro, Viti Ruiz, Nelson Ned, Humano, and countless others. He is co-founder, writer/arranger, and director of Mambique (Brass Roots), a unique group showcasing trombones and congas in the style of the great Willie Colon. From Chicago, Jewell first appeared on the east coast with the Boston-based group, the Either/Orchestra. From 1985 to 1995, he performed concerts and conducted clinics throughout North America and Europe, including the North Sea Festival, Pori Jazz Festival in Finland, DuMaurier Festivals throughout Canada, Monterey Jazz, and the Knitting Factory in New York City, among others. A graduate of Berklee College of Music, Jewell has appeared on numerous recordings, with artists such as the aforementioned Either/Orchestra (with a Grammy nomination among the many awards), Mighty Sam McClain, Julius Hemphill, Bob Moses, and many more. Currently trombonist with Mighty Sam McClain, the Bad Art Ensemble, and RumbaNama, he is also co-founder of Mambique (Brass Roots) with Mondongo and the great local percussionist, Manolo Mairena, a Grammy nominated artist with Clave Secreta.